Racine is located in Racine County in southeastern Wisconsin, about 25 miles south of Milwaukee, at the mouth of the Root River on the shores of Lake Michigan. French explorers Robert de LaSalle and Louis Hennepin were the first Europeans to visit the area in 1679. They were met by Potawatomi Indians who had lived there for centuries, hunting for game and eating the wild rice, corn, potatoes, squash, pumpkins and fruits that grew in abundance. The Potawatomi continued to live there until 1833, when they were forced to cede their lands to the U.S. government. The first white settlers came in 1835; incorporation as a city came in 1848. 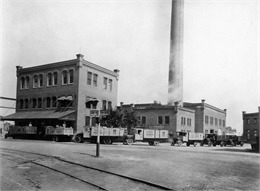 Racine's chief exports in 1849 were wheat, flour, beef, pork, corn, oats, hay, butter and cheese produced by local farmers. These were sent to eastern markets on ships from Racine's harbor. Plank roads to Burlington, Delafield, and Wilmot were also constructed. In the early 1840s, immigrants from Wales and Denmark joined Racine's largely Yankee pioneer settlers. Racine College was founded in 1852 and the first high school in Wisconsin opened there in 1853. Prominent Racine residents include J.I. Case, who revolutionized grain production with the invention of the thresher in 1843; Joshua Glover, the fugitive slave whose arrest and rescue in 1854 brought national attention to abolitionism in Wisconsin; J.W. 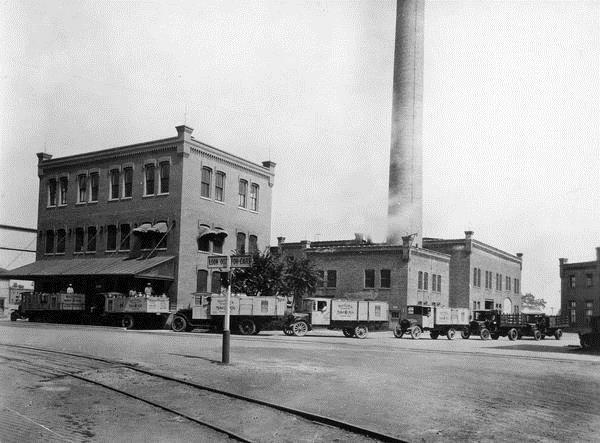 Carhart, who built the first steam-propelled automobile in 1871; William Horlick, who invented malted milk in 1887; and Walter Goodland, who, in 1942, became Wisconsin's eldest governor at age 80. See more images, essays, newspapers, museum objects and records about Racine.